Water levels are rapidly rising at Lake Red Rock as several streams in the Des Moines River basin top their banks. 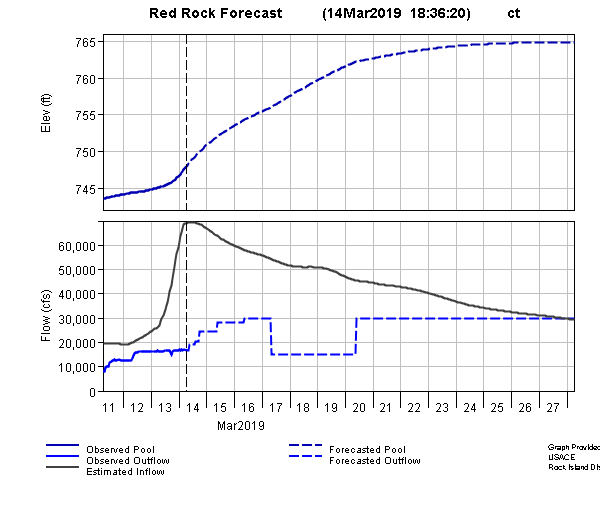 According to the U.S. Army Corps of Engineers, water inflows are rising to over 35,000 cubic feet per second, with the overall water level expected to rise as much as 20 feet over the next ten days. With flooding upstream, debris from damage caused by those rising waters may be floating downstream and into the lake. The water level will likely break a previous March record for the crest, as the last time it was this high in the month, it was in 2009 when it topped at 754 feet above sea level. Forecasts will have it top out near 765 feet above sea level by the end of the month, which is approximately 23 feet above normal pool. Stay tuned to 92.1 KRLS for the latest weather information.